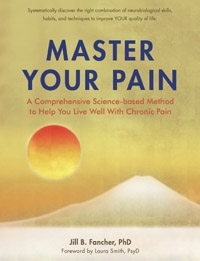 Master Your Pain: A Comprehensive Science-Based Method to Help You Live Well With Chronic Pain is workbook that explains the science of neurobiology and applies this to the reality of living with pain. Based on the author's professional experience as a pain psychologist and her own experience of dealing with chronic pain, it provides a set of skills based on cutting edge research and techniques—skills that each reader can use to reduce his or her own pain. Master Your Pain provides techniques that can be used in the privacy of one's own home and integrated easily into daily life. The Mastering Pain Method was developed at Evergreen Behavioral Health through a natural integration of evidence-based psychological therapies with individuals with chronic pain. Today the clinic has expanded from a single provider to a growing group practice. In-person therapy provides the opportunity for tailoring skills to the individual to meet their unique needs. Therapy is person-driven and may focus on pain and/or a range of other areas of psychological distress identified by the individual. Some providers at Evergreen Behavioral Health are trained in The Mastering Pain Method and is able to continually consult with the developer and research team on the latest outcomes, continually enhancing the process and the skills. In-person 12 week classes now offered at both Evergreen Behavioral Health and Legacy Salmon Creek Pain Management Center. To sign up call: Evergreen @ 360-450-0140 x 0, Legacy @ 360-487-2700. In-person intensive seminars COMING SOON! FOR PROVIDERS - Drs. Fancher and Smith have begun offering continuing education courses in the community, educating mental health and physical health providers on The Mastering Pain Method.